We offer Agricultural Chemicals, free flowing blue granule powder, which is odorless and are available without any lumps. Copper sulphate is a very versatile chemical with extensive range of uses in industry. It is used as raw material for the production of many copper salts. Copper sulphate is generally used as insecticide in agriculture & wood industry. It is also used in agricultural chemicals, feeds, germicides - in the textile and leather industries, pigments, electric batteries etc. We -Jyoti Dye-Chem have always followed the policy of spending a huge part of our quality time and revenue in the research, development of the market so that we can source the right range of Industrial Chemicals, Agro Chemicals, Agricultural Minerals for the varied requirements of our clients. Further we also have with us services of experienced team of experts advanced warehousing facilities, which help us to successfully meet our commitment to provide superior grade of chemicals and minerals. 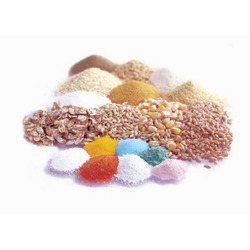 We are one of the leading manufacturers, suppliers & exporters of wide range of high quality minerals and chemicals used as feed grade minerals, agricultural products and farm products. Along with above we manufacture natural catechu tannin.